Sensitivity and selectivity are the major concerns of a short wave enthusiast when he looks up for a receiver. Commercial communications models with superhet circuitry surely satisfy his requirements, but these are expensive. He would rather go for a homebrewed radio, being a regenerative receiver an affordable choice. I'm also a short wave listener and for some time I used my family's MW and SW tube radio, Philips brand. Then I switched to a Sony ICF-7600 with ceramic filters in the IF stages. 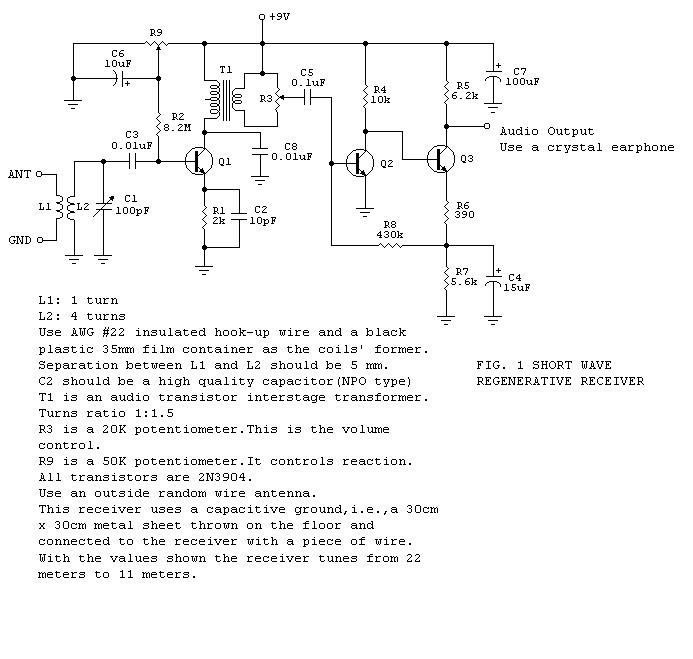 High selectivity was attained with this radio receiver. 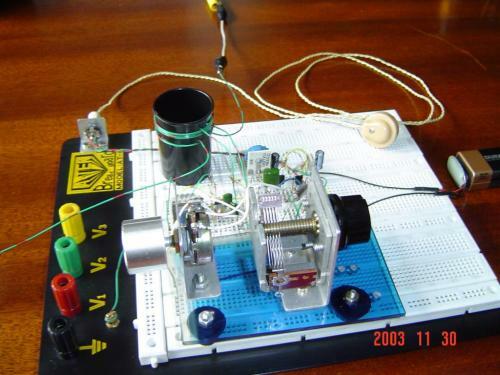 I then discovered how much fun it was to build radios in my spare time, having tested a variety of designs available in books and on the web. Finally, I managed to make my own designs. One of them is shown in Fig. 1. It is a nice performer and will tune from the 22 meter international broadcasting band down to the 11 meter band. It is best that the 100 pF variable capacitor be a vernier type. Tuning will be easier this way. Q1 is the amplifier-detector and along with its associated circuitry forms a common collector Colpitts oscillator that not actually oscillates: it operates as a regenerative amplifier, with R9 as the reaction control. In achieving this result, the transistor's input capacitance plays an important role. The oscillating mode is employed when copying CW or SSB. Otherwise, the stage should be left very near the threshold of oscillation for maximum sensitivity and selectivity. Q2 and Q3 form a high gain audio amplifier and ample volume should be expected at the output. This is why a volume control has been included in the circuit. A high impedance crystal earphone should be used at the output. I really liked your treatment on the colpits regen oscillating reveiver. I plan to build a similar design with low voltage vacuum tubes. Any suggestions?